"Seventeen-year-old Greg has managed to become part of every social group at his Pittsburgh high school without having any friends, but his life changes when his mother forces him to befriend Rachel, a girl he once knew in Hebrew school who has leukemia." I thought this book was going to be a heart-warming tear-jerker. I was wrong. Let me start by saying, if you don't want to read a book full of cursing and crude sexual references, then this isn't the book for you. Me and Earl and the Dying Girl is a hilarious book about an awkward teenage boy named Greg and the things he deals with in his life, including disease and death. He is the boy at school who is friends with everyone - he has the whole "school hierarchy system" worked out. First day back to school of his senior year, his mum tells him that his ex-girlfriend Rachel, from Hebrew school, has got a rare form of leukemia - and he has to be friends with her. This starts an awkward friendship between the two. This book isn't really about death. It isn't overly about Greg dealing with death. It doesn't really have a plot line - which is a refreshing change. Although, Greg's wisecracks and self-deprecation did get slightly tiresome, the way it's written, with bullet points and film script conversations makes for a fantastic read! 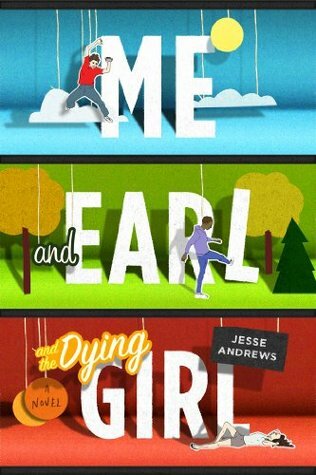 I recommended "Me and Earl and the Dying Girl" as one of my "Picks of the Week" a few weeks ago on my blog. It sounded like an interesting read, but I haven't gotten around to buying it yet to check it out myself. Thanks for the review!